Despite only teaching for three days, it has been a rather long week filled with a lot of information to ruminate and digest. On Tuesday, after a relaxing day off, I returned to school for a full day of staff development sans my students. These days are nestled into the calendar here and there to provide an opportunity for educators to glean important updated trends in education. After a delicious lunch the entire staff attended a session titled School Violence; Active Shooter Incidents Awareness. It was presented by two ex-law enforcement officers who now work for Homeland Security at the state level. Although the training is in its infancy I am confident that a lot is taking place on both the federal and state level to make sure that protocols are in place should the unthinkable occur inside of our school building. The facilitators were sympathetic to the new role that teachers must now assume. Not only must we lead our students but, now we may have to protect their lives as well. I was moved by the compassion the two men conveyed toward us as we began to comprehend the enormity of our new role. The objective for the training was not to frighten us but rather to establish a perspective for how we might integrate our new role into what we already do as teachers. How will we take control? How will we keep our students calm and quiet during a lockdown? Where might we hide our students to protect them from gunfire? After the training I barely recognized the profession that I had chosen to pursue more than 20 years ago. Needless to say I left school on Tuesday weary from my anxiety. Arriving home I changed quickly and reported to the barn. There to greet me were my therapists. Immediately, I felt my inner strength surge and my emotions come to calm. The animals were all going about their day with the same mission they had the day before and the week before that. I hugged my goats one at a time beginning with Lacey who greeted me at the barn door with a gentle, "Huaa, mmm". I ran my fingers through all of the goat's plush fur. Their coats are working overtime this winter to insulate them from the extended cold weather. Then I found the donkeys out behind the barn. Bing's hoarse 'wuffle' greeted me as I bent down to kiss his irresistibly soft muzzle. He stood perfectly still and relaxed as I fussed over him. Behind Bing, Frankie waited patiently for his turn. The aroma from the barn, manure and the animals themselves welcomed me home like a great big hug. On Friday, the Adirondack Museum sent a 'hands on' presentation to school about trapping, hunting and fishing in the Adirondacks. The program provided a superb opportunity for our students to learn about the history of the region we live in. In a large pack basket was a pile of pelts once worn by many of our native species including a coyote, bobcat, fisher, deer, otter, beaver, bear and red fox. They had all been expertly preserved. No doubt the fur, which had been harvested during the animal’s peak condition, had once belonged to healthy robust specimens. I plunged my fingers into the coat of the bobcat and was taken by how soft and thick it was. I pushed my fingers down to the skin and immediately became aware that something was missing. Below the luxurious exterior there was no warmth. No defined muscular structure pushed back against my fingers. There was no moisture, oily residue or dander. My fingers recoiled perfectly clean. The irony and superficiality that beauty is skin deep is not lost here. If what really matters is deep within us then why do we value these pelts? Why do we still strip animals of their lives in order to possess their coats? 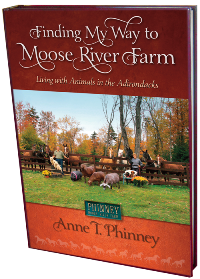 I understand the historical aspects of harvesting animals in the Adirondacks. I accept the necessity for conservation which includes hunting to keep populations of various species healthy and I eat meat. Trapping, however, is difficult for me to justify. Later that afternoon I took to the woods with my goats, donkeys and dogs in tow. In their company the cold crisp air and the promise of a carefree weekend lifted my mood. I couldn't keep my hands off of them. My fingers burrowed deep down through the lush pile of Lilly’s coat. Ignoring the softness and texture my fingers sought the warm proof of her existence, still alive, still breathing and still bringing me great joy. Lowering my face to her muzzle I was rewarded with warm puffs of her breath. I held her close to me, my hands still seeking reassurance that her body was attached to her fur. When she'd had enough of me, I grabbed big Liam and plunged my fingers down to his skin. He too was still whole beneath his coat. After repeating my grasp on the goats and donkeys, I performed a similar examination on my little dogs. They sat in my lap smiling as I rubbed and scratched the skin at the base of their coats; each one so different from the others. Huxley’s short hair was the warmest of all. Its shiny smooth texture reminded me of the inert otter pelt from the pile in the pack basket. Frankie waits for his turn after Bing. The Doctors will see me now. I can't get enough of them. Can't keep my hands off. Liam's coat is thick with cashmere this winter. In a few more weeks he will begin to shed in puffs of fluff. Even Dr. Lowtchee provides therapy after a long week. Her sense of humor reminds me to lighten up. Nina's coat is classic wiry terrier. Hayden's coat is silky fine...and greasy. Celebrating Valentines Day this week got me thinking about how my animals demonstrate affection. Arguments have ensued for centuries about whether or not animals are capable of love; either giving or receiving it. One has only to live with a dog or cat to believe that indeed they do. When our Dachshund, Huxley, wraps his entire wiggly body around my neck in the morning, he is clearly gesturing that he wants to be as close to me as possible. No other reason exists for this behavior. When our West Highland terrier, Nina is distressed by thunder, lightening and the power clicking on and off, she leaps into my lap. There she seeks comfort from my reassuring words and arms that hold her until the scary noises stop. Our first pig, Noah hoisted himself up on the sofa to sit in my lap even after his weight exceeded mine. Quietly, he snuggled against me for an hour or so until bedtime. These are just a few examples of affection displayed by the animals in my book. The behaviors compliment the love that humans are capable of giving. It is not important to contemplate the scientific origins of these behaviors. The euphoria that exists in the moment of our mutual affection is proof enough to believe it. And I do! Its been another bitter cold week ending in a snowstorm that blanketed the entire Northeast. 10 inches of fresh snow has deposited a crisp layer of white frosting in our woods. The clear blue sky overhead complimented the snowy landscape on our walk with the dogs and goats today. For the last few weeks the donkeys have joined us on our daily hikes. It appears that they too love our companionship. So come along and enjoy the procession. Lacey looks forward to our daily walk. Recently, the donkeys have begun to tag along. Every time I publish a post on my blog, I wait with great anticipation for the pageview counter to begin up-ticking away! Almost immediately after announcing the new post on Facebook, there is evidence that someone out there is reading the new entry. It’s thrilling to share my writing with those who wish to know more about Fiona, Promise, the donkeys, the horses and Rosemary to name just a few of the main characters from previous posts. The assumption that I make over and over again is that my readers love animals and completely empathize with the connections that I have made with my own. Therefore readers, you have caught my attention. 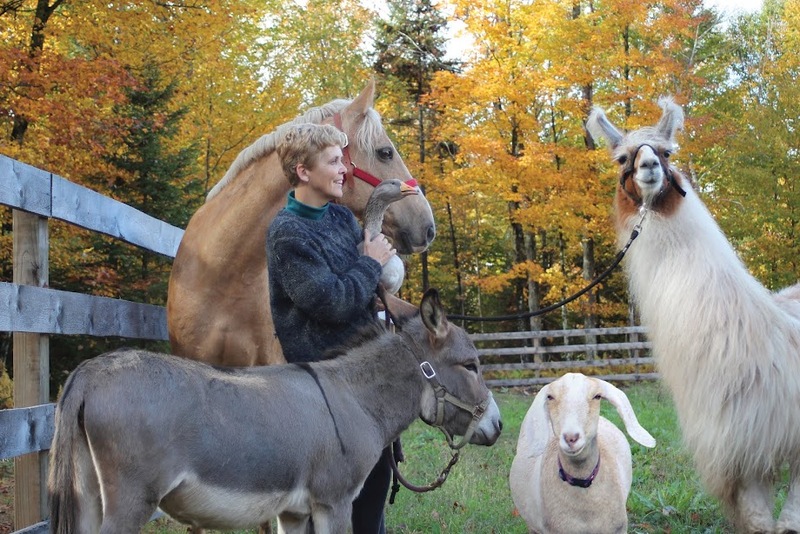 This post is more or less an invitation for you to share the animals from your lives. So, if you were writing a memoir, (and I strongly urge you to), about the animals in your life, who would some of the main characters be? Do you have a dog, cat, horse, etc…who you rescued? Perhaps they rescued you. Is there a special animal who supported you through childhood, difficult times, or raising your family and, although he is gone now, you have never forgotten the impact he had during your years together? Has a pet ever arrived at the most appropriate or extraordinary time? Now its your turn to share these special 'tails' from past and present with other animal lovers and of course, with me! 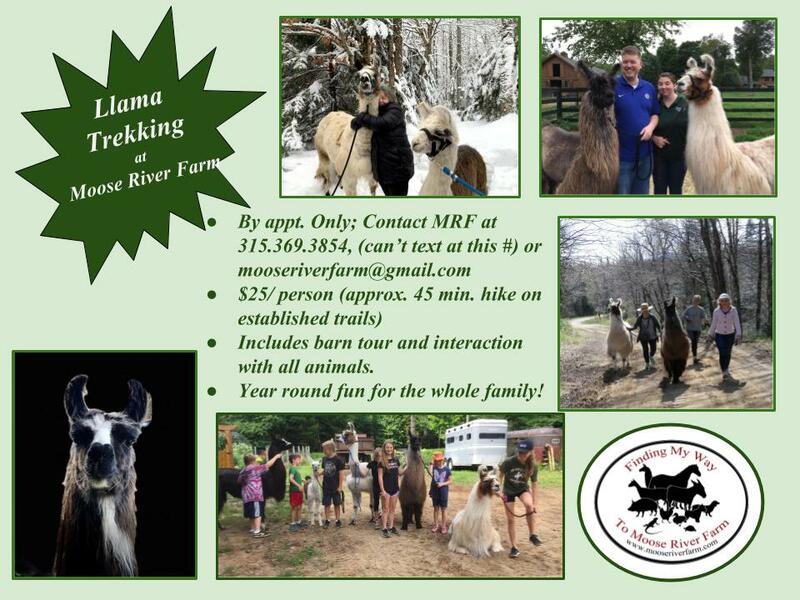 Use the comment option at the bottom of this page or post on Finding My Way to Moose River Farm's Facebook page. Pictures can be posted on FB too. Can't wait to read about the special animals in your life. 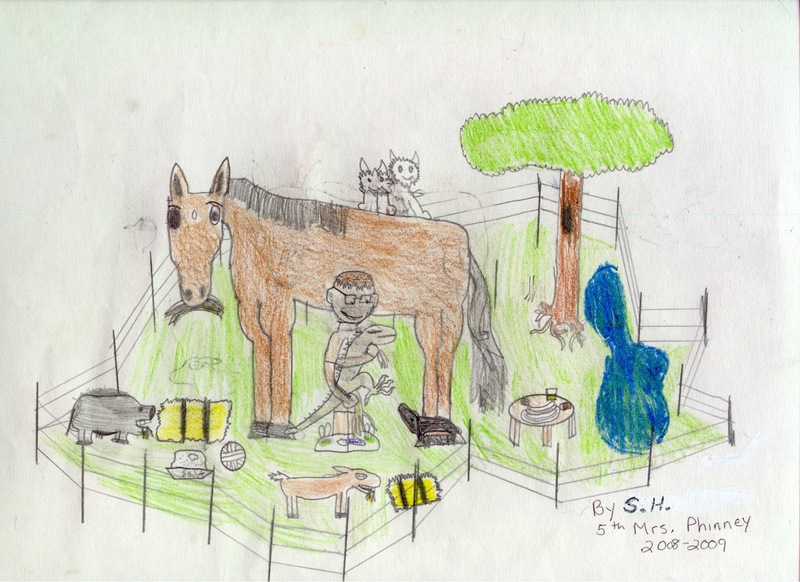 After visiting MRF for a class picnic, one of my student's illustrated the activities he engaged in that day. 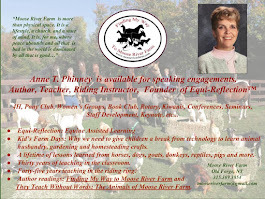 Note: hot-dog lunch and hot-dog, Huxley, Fiona and a goat eating a bale of hay, Rosemary wrapped in his arms, and the Westies sitting on the back of our beloved Sandi, (Just a School Horse).